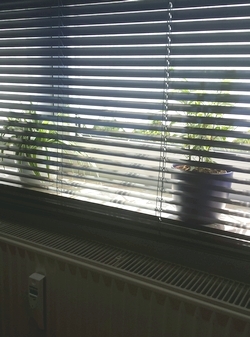 A tiny heatwave (2-3 days) with around 35 °C has reached my parts of the world and as boring as it may sound I decided to spend the weekend holed up in my apartment, at a comfortable 22-23 °C and the blinds closed to keep the heat out. Feels a bit weird like being in quarantine or something, but I don’t care. I really couldn’t be bothered to get out today. So I thought I might be catching up with some blogging, even though I don’t really have anything special to write about. Work and other stuff over the last two weeks seemed to have taken a toll on me, because I’ve been so exhausted over the last few days. I also didn’t sleep well, so I hit the wall of exhaustion pretty early every day. I hopefully managed to catch up on some sleep last night, at least the dark circles around my eyes don’t look as bad as they did yesterday. Still some way to go though, so I think a day of relaxing (bed, couch, whatever) can’t hurt. At the office I’m holding down the fort, as the two coworkers from my team are on vacation at the moment and I’m in charge of everything and I’m not used to being in charge and I don’t really like being in charge. I guess the mental stress of that added to the general state of exhaustion. Thursday was the first day, that felt like it was a good day (job-wise at least) and I had planned to write a short blog post to mark it. And then a plane was shot down over the Ukraine and Isreal started it’s ground offensive in Gaza and the day stopped being a good day. I admit, I tried to avoid most of the news (on TV or online) since last night, because it’s all so sad and heartbreaking and just so incomprehensible. And it makes me feel so helpless. As a reaction to that I’m trying to focus on the good things in my life, even though I do that with a bit of a guilty conscience. I guess that’s the dilemma of the modern times we live in, isn’t it? I don’t know. Maybe the weight of the world is doing it’s bit to drag me down and exhaust me as well? Next weekend will have two fun things happening. At least I still hope the first one will be broadcasted / streamed online: The Outlander Panel at San Diego Comic Con on Friday. On Saturday Bro2 is hosting the annual Fun Darts tournament / barbeque. The weekend after that I’m off for a weekend with some friends, wellness, great food and a trip to the beach. Two weeks after that I plan to see Frank Turner at a free festival in Cologne mid-August. And after that it will only be four more weeks till my vacation on Jersey, Channel Islands. Only three more weeks till my vacation itself, I will spend the first week at home. Probably once again being pretty lazy. Or not. Depending on a lot of other stuff I think. Anyway… Jersey: beach, ocean, cliffs, castles, countryside, teatime… I can’t wait. It’s still eight weeks to go, but I hope with all the other fun stuff happening in between and a job to keep me busy, time will fly.